What Is An Automatic Transmission Cooler and What Does It Do? An automatic transmission cooler is designed to cool down the automatic transmission fluid in your vehicle. When the temperature of your transmission fluid reaches about 93°c (or 200°f), the capabilities and effectiveness of your transmission fluid is greatly reduced. Overheated transmission fluid has the potential to erode seals in your transmission gear box and diminish the life span of your transmission fluid. An overheated transmission fluid will also be ineffective at lubricating moving parts properly and it can raise the internal temperature of your vehicle – potentially causing unnecessary and expensive damage to your vehicle’s engine. Most vehicles will have a built in transmission oil cooler located within the front radiator. This allows fresh air to cool the fluid before it circulates back to your automatic transmission gear box. However, if you use your vehicle for towing or carrying heavy loads, then this will put extra strain on your transmission and heat the transmission fluid much quicker than normal. If you are going to use your vehicle for towing and transporting heavy loads on a regular basis, it is recommended that you install an aftermarket auxiliary transmission cooler. These are available for most vehicles and can be installed by your local transmission specialist. How much does your vehicle weigh? How much cargo will you be carrying on a regular basis? What is the maximum weight that you are expecting to carry? Will you be towing or carrying your load on an open road such as a highway where you are travelling at high speeds for most of your journey? Or will you be transporting your load through urban traffic where you may need to stop and start continuously before you reach your destination? What is the terrain like where you will be doing most of your towing and transportation? Are there many hills in the area? If there are, this will put extra strain on your transmission and cause the fluid to heat at a faster rate. As you can see, simply choosing a suitable transmission cooler for your vehicle is quite a technical task in itself. You also need to make sure that you install an auxiliary transmission cooler properly otherwise it will be ineffective. An improperly installed transmission cooler will actually do your vehicle more harm than good. A damaged automatic transmission can be very costly to repair and in severe cases, you may need to have your automatic gear box totally rebuilt which can end up being very expensive. It’s always a good idea to have a qualified professional deal with matters such as this as it will give you piece of mind to know that your transmission cooler has been installed correctly and your vehicle is not at any risk of unnecessary damage caused by a faulty installation or repair. If you need a qualified professional to take a look at your transmission cooler or you would like some expert advice on which auxiliary transmission cooler is most suitable to be fitted to your vehicle, then contact Bob at Bob Hunt Automatics. 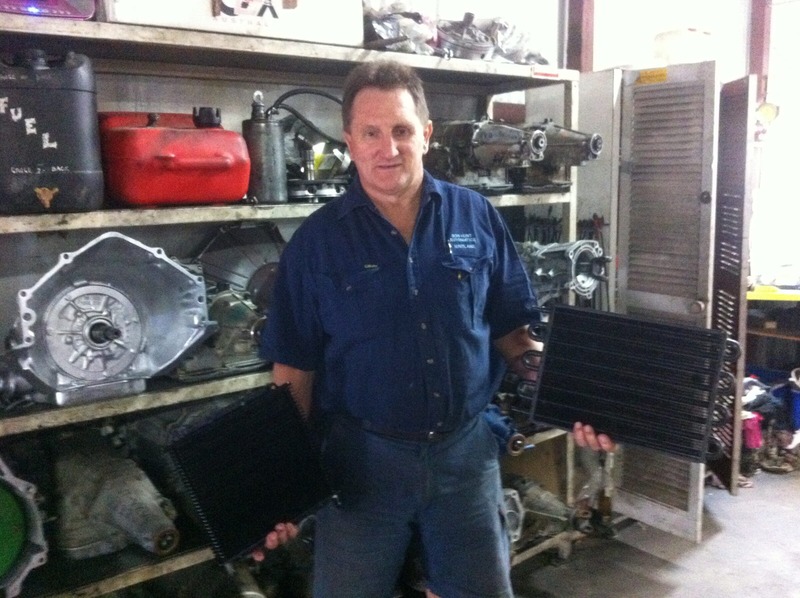 Bob has decades of experience in dealing with automatic transmission coolers and he is one of the Hunter Valley’s premiere automatic transmission specialists. To arrange an inspection of your vehicle, call Bob Hunt Automatics on 02 4933 1141 or you can contact him via the contact page.